As a series of cheap toys, the Spacex range was pretty ambitious compared to other such series usually being limited to half a dozen toys or so. 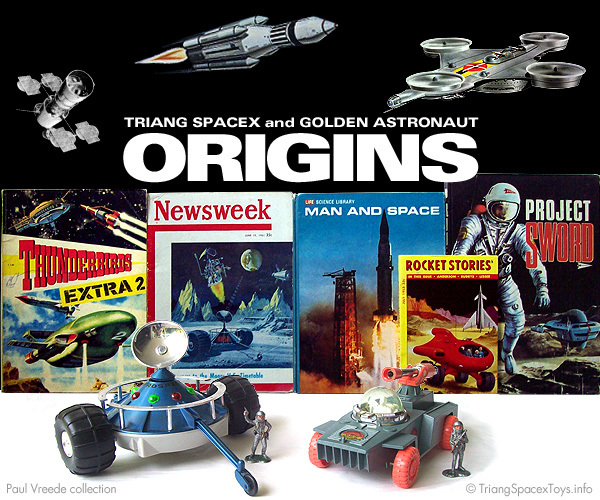 Continuing in the spirit of Project Sword toys, a range of vehicles was established to cover various stages of space exploration. But whereas Project Sword was based on a particularly bleak premise of a select number of humans being evacuated from a doomed Earth, Spacex presented a much happier picture of bold exploration. This was very much in keeping with the optimistic views of the time, where every contemporary source -even the serious ones- was expecting space exploration to continue rapidly and unabated. Moon bases, space stations and missions to other planets were planned and forecast to happen within decades. So, a varied range of space toys was to be designed, which also needed to be very attractive to be commercially interesting. Perhaps a list of vehicle types was thought up to be filled in with suitable designs, though looking at the toys themselves I thinks it's just as likely that attractive designs were found and allocated a role in the Spacex fleet. I can imagine somebody looking through a comic annual, seeing a spaceship and saying "this looks nice, let's turn it into a Pleasure Cruiser." It was probably a combination of both. And as will be evident from the pages in this section, a variety of sources were consulted for suitable designs. With his background at Century 21, Jack Rosenthal will have thought of going through the comic strips produced there, which yielded about half the designs for the Spacex Stage 1 fleet. The odd one out is the Pleasure Cruiser, which came from a comic by a competing publisher. TV21 magazine also had articles about real space projects, which included the Lockheed Moon Base. Which may have prompted a look into other concepts and proposals for real-life space exploration. Most of the books we've found are the kind that a good public library will have had at the time (and indeed one or two books in my collection are ex-library copies). One book we're certain about is Man And Space from Time-Life, because it had already provided the source for the box art for a Project Sword toy (which would in time get its Spacex equivalent in the later series), and now inspired another two Stage 1 vehicles. Other books and articles about space exploration provided more, where for a number of toys we can be fairly sure of having traced the actual publications that were used at the time, while for most of the others I'm pretty sure we at least found the specific illustration. Next there are a number of designs taken over from larger toys. Most of these had been part of the Project Sword series, but, significantly, were mostly designs that originated from real-life aerospace projects. This may have been to avoid conflicts with the producers of the other, fictitious Sword toys from whom Jack Rosenthal had obtained the toys included in this range. The Mobile HQ is an exception here, being noticeably different from the Sword Moon Bus. The Patrol Cricket is the other exception, being blithely copied from a competing toy range with apparently less concern about infringement. And then there's the Hawk which could possibly also be based on a larger toy depending on when that was first produced. A few designs from other sources complete the Spacex fleet - a spaceship from a movie, a cover illustration for a sci-fi paperback and a few model kits. Some of these may also have found their way into other publications to be found there, similar to two other paperback covers appearing in another book together. Finding all these design origins took a lot of time and luck. And a lot of collaboration as well, without which this section would be nowhere as far as it is now. 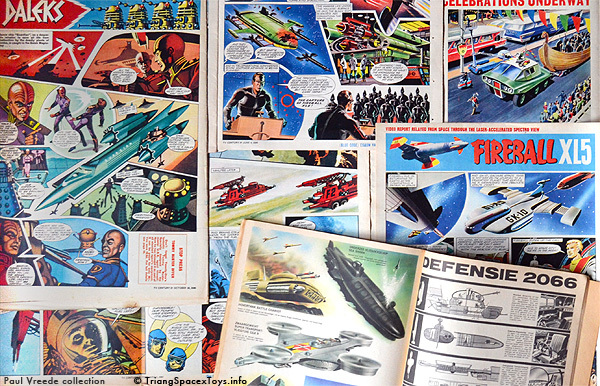 Some origins I had known about for a long time, such as those appearing in the Dutch Thunderbirds Extra 2 annual from my youth. 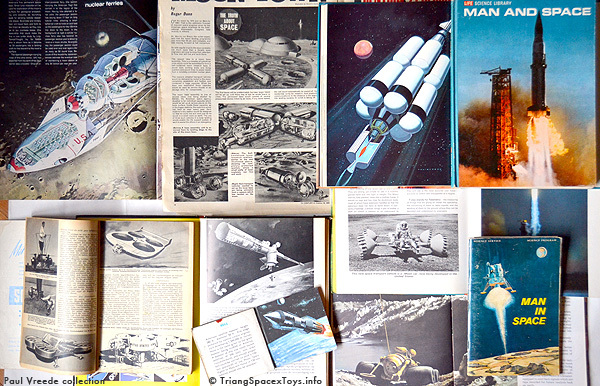 The Man and Space book I quickly obtained after Mark Wright sent in scans to the Major Matt Mason email list back in the 1990s (it also includes a picture of the real-life MMM Moon suit) and where I was delighted to also discover two of my Spacex toys. I only knew about the Stage 1 series at the time, but as it turned out the book had more on some of the later series' toys as well. This book also prompted me to look more into contemporary aerospace projects. 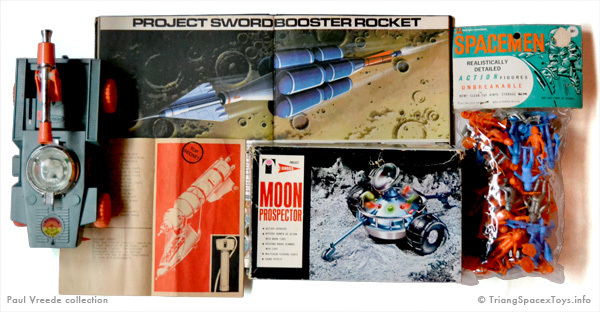 The next contribution to my knowledge came from Paul Woods, Supremo of Project Sword :) , who had compiled a checklist identifying a number of Spacex toys (incl the later series) as being derived from Sword toys. But which turned out later to have more history behind them as well. Fast-forward to the late Noughties and Paul's Moonbase Central blog, where Kim Stevens sent in a number of comic strip scans featuring Spacex origins. Which prompted me to supply (mostly aerospace) origins I had found, and Mike Burrows to add another four that he knew about. A number of other people also helped out in the course of time - I've done my best to include everybody on the pages in this section, in the text and/or the image credits. For some toys there's a lot to tell, for some there's less. Some are straightforward, others are not, or just kept on growing! And at this point, there's still one toy we haven't found anything for, and the Hawk which remains inconclusive. The search will go on!